I remember when nutella wasn’t readily available on the shelf of every grocery store in town. My sister, the francophile, discovered it when she went to France as a foreign exchange student. She came back raving about nutella on croissants for breakfast. Nutella on baguette for snack. Nutella on cake for dessert. It was all nutella. All the time. We had to make a special effort to buy it. And, we’d get it for her for Christmas. And she loved us for it. Now, nutella is easy to find. But, sadly, I can’t eat it. See, it’s full of dairy, which is definitely out for me. It’s also full of sugar, which isn’t so spectacular for me, either. My version is not sugar-free. But, it is dairy-free. And, it’s as simple as it gets – just three ingredients. Even better, it’s a ratio recipe – meaning you can make as much or as little as you like, as long as you measure by weight. The kiddo suggested eating it on apples. There’s my health-conscious kiddo for ya. I said, “Um, how about on these leftover banana pancakes instead?” He didn’t argue. When cooking with ratios, you typically have 1 ingredient as the “base” ingredient off of which others are based. In bread, that’s the flour. 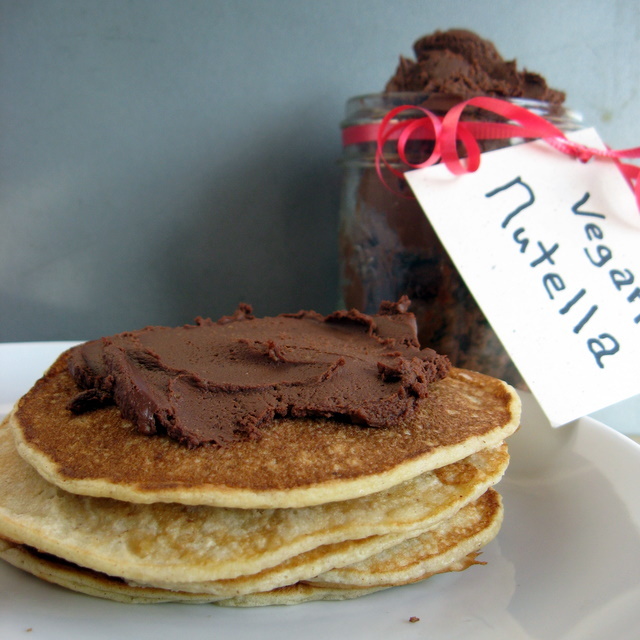 In this nutella recipe, I’ve chosen the hazelnuts. I’ve listed the weights I’ve used in parenthesis after each ingredient. This batch makes enough to fill a quart pint mason jar about 3/4 full. To scale the recipe up or down, choose your weight for the hazelnuts and then do 1 and a half times more chocolate and twice as much coconut milk. Make sense? Preheat oven to 350°. Spread the nuts on a baking sheet and bake for 10 minutes, until toasted. Pour nuts into a clean dish towel and rub vigorously. Most of the skins will fall off. You may have to pick out the ones that are skinless and repeat the rubbing several times. In a double boiler or metal bowl over a sauce pan, heat the chocolate and coconut milk until chocolate is completely melted. Pour into food processor and pulse until mixture is fully mixed. Transfer to jars and cool. I keep mine in the fridge. It does harden a bit more than regular nutella in the fridge, but softens at room temp, and is still soft enough to spread on sturdy bread or apples straight from the fridge. For more slightly indulgent goodies, check out Slightly Indulgent Tuesdays. This entry was posted in chocolate, coconut, desserts, grain-free, nightshade-free, nuts, vegan and tagged chocolate, nutella, nuts, recipes, spreads. Bookmark the permalink. Oh this looks delicious and super easy-yeah! Thanks Laura – it IS super easy. And it would make great last-minute gifts for Christmas, too. Yum! Hey can I make this with hazelnut meal? I don’t see why not. You’d still want to process it to release the oils. But, essentially you’re just skipping the first part of the processing. I doubt it’s been toasted, so it won’t have quite the same toasted flavor. But, it will still be good. Fantastic recipe thanks & so simple …. a perfect Christmas gift. Mmmmmm …..
MMMMMMMMM,…What an easy yet so flavourfull recipe! What’s not to LOVE here? The spread ooks so appetizing! God, I think I have to take the next flight to you and give you a big, big hug for that super-awesome recipe, that made my day right now 🙂 Thank you so much ! LOL. You’re very welcome. I hope you enjoy it. Of course I do 🙂 I’m going to try it out within the next week. My kids fell in love with Nutella when we spent the summer in Spain a few years ago…you brought back so many memories and it is true that a HUGE snack over in Europe is Nutella in fresh bread. The freshly baked warm bread is Europe is out of the world too and available EVERYWHERE. We used to go get it at the gas station. Too bad the bread was definitely NOT gluten-free and the Nutella was not dairy-free either. There are also some recipes around I’ve used at home for grain-free loaves too. So good! My partner is obsessed with Nutella, but also doesn’t enjoy the looks I give him when he buys it at the supermarket. Now I have a great recipe I can whip up for him… and might even sneak into an empty Nutella jar to see if he notices the difference straight away! This is AMAZING! Who knew it would be so easy to make – I am absolutely going to make this for my family. wow so wonderful! i will so making this tonight 🙂 Thank you! I’m sure you could use peanuts, or just go straight to the natural peanut butter. Since it’s by weight, just sub the same weight. The second one is my go-to ganache, and at room temp, it’s soft enough to spread. Zomigod! Nutella is like crack to me, lol. Your sister and I could be Nutella BFFs. Finding a healthier version is so dangerous for me, but you KNOW I’m going to make this right quick. LOL. I’m not sure it’s THAT much healthier, though if you use a dark chocolate it will certainly have less sugar. I hope you enjoy it! See how dangerous? I’m already calling it healthy! lol Yeah, yeah. I’ll use organic chocolate. Attempting to make now, but I can’t get the skins off! Must they come off to make this? Just do the best you can. They won’t all come off its. Ok.
Chocolate is easy, because it’s usually in squares by weight (usually an ounce), and one ounce equals about 28 grams. I’ll try to get you volume measurements (approximate) for the nuts and coconut milk tonight. Does anyone have any idea of the commercial ingredients? Just curious. Here’s a link I found where the author did a great deal of detective work on Nutella. Ooo – very cool. Thanks for the detective work! According to the product label, the main ingredients of Nutella are sugar and vegetable oils (mostly palm oil), followed by hazelnut, cocoa solids and skimmed milk. Nutella is marketed as "hazelnut cream" in many countries. Under Italian law, it cannot be labeled as a chocolate cream, as it does not meet minimum cocoa solids concentration criteria. About half of the calories in Nutella come from fat (11 g in a 37 g serving, or 99 kcal out of 200 kcal) and about 40% of the calories come from sugar (20 g, 80 kcal). I think Your Nutella looks wonderful!!! Pleas excuse the German language.